Not only is she involved in almost every high school sport, but she also excels at each one of them. The perfect example is her most recent achievement: taking first place in the state for her weight in wrestling. The state championships were held March 3 in Marshfield. Asia is the daughter of Jeriah Rave and Michelle Rave. She’s been Wisconsin state female champion four times out of the five times she’s been to state competition. The time she wasn’t champion, she was the runner-up. Asia, a sophomore at Black River Falls High School, has been wrestling since she was in the fourth grade and she’s always been good at it. “I like throwing guys around,” she said. She now wrestles in the 182/195 weight class, close to heavyweight as she describes it. Throughout the wrestling season, she has only wrestled against males but had to wrestle females at the state competition. Asia also placed third in national competition when she was in eighth grade. “I’ve always been the first to go off from being normal,” she said. She could qualify for wrestling at state for male wrestling. Females are able to attend the boys state tournament and can qualify through regionals and sectionals. She went to state this year, wrestling in the 195-pound weight class. For female only state competition, there are no divisional competitions to ramp up to the state level. Wrestling is a physical game in which she excels and enjoys very much. “Wrestling is either a love or hate relationship for many people. Some people oppose skin-to-skin contact with another person while other people feel strong by dominating over someone else,” she said. 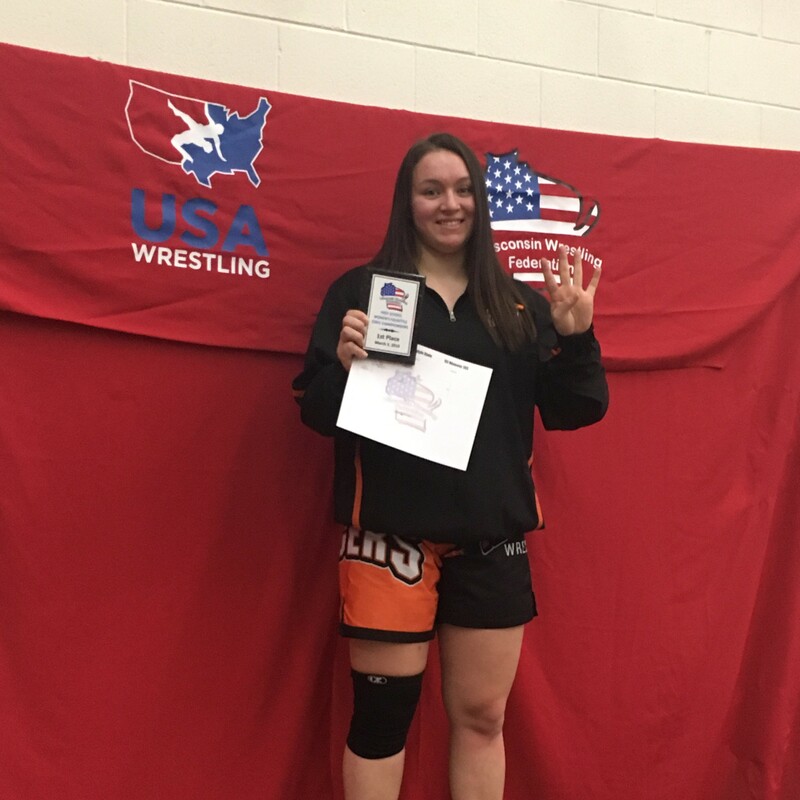 When her father addresses her, he shouts out, “Hey, state champ!” Her mother is also very proud to have a daughter who is successful in a male-oriented sport. Asia also excels with the Black River Falls track and field team. However, since that time, Asia has broken her own shot put record. This time she set the new record of 37 feet, 10.75 inches on April 6 at the Neillsville indoor track and field meet. Along with shotput, she competes in the discus, triple jump, and sprinting races. With so much emphasis on sports, a person might assume that her energy might be placed all in that area. Not so. Asia also is a top-notch student academically as well. Last season she played varsity basketball and didn’t wrestle with the high school team, but she still went to state. She took the year off from high school wrestling. Now, she is contemplating playing basketball next season instead of wrestling during the season. The two sports overlap at about the same time, so she needs to pick one over the other. Also, she is anticipating wrestling with the national team next year – Team Wisconsin. She’s been with the team since eighth grade, wrestling in River Falls, Stratford, Mauston, and Wrightstown. The high school wrestling season is November through March, with about 25 matches during that time. Her workout regime is nonstop. She comes from a large family, being one of nine children, so interaction with other youth comes naturally. As for her future plans, she wants to go to the U.S. Naval Academy in Annapolis, MD, after high school graduation.